New sights on a morning walk downtown. – Cool San Diego Sights! Swords of Chivalry knights battle in Balboa Park! English knights, cute Corgis, Harry Potter and more! Earth Day at Old Town’s Native Plant Garden. Fun times at the Wheelchair OTL Tournament! New sights on a morning walk downtown. 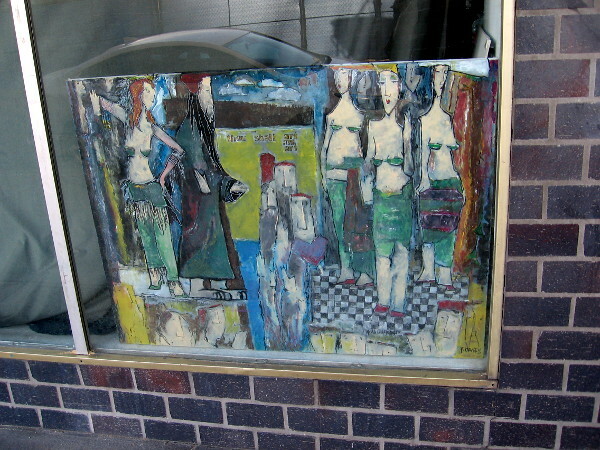 A colorful canvas in the window of James Watts’ studio on Seventh Avenue. I don’t recall seeing this artwork before. 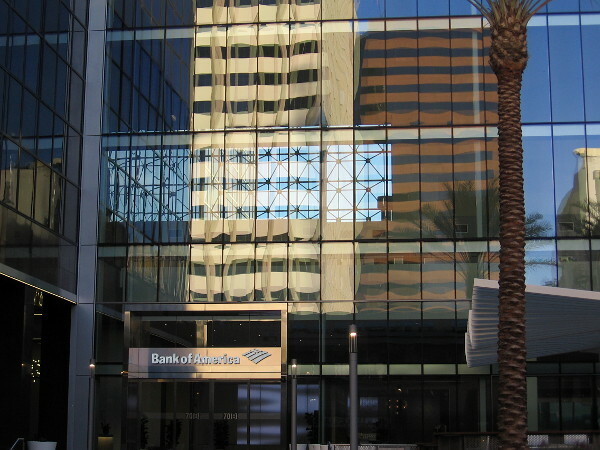 This morning I walked south down Seventh Avenue, from the top of Cortez Hill to Petco Park. 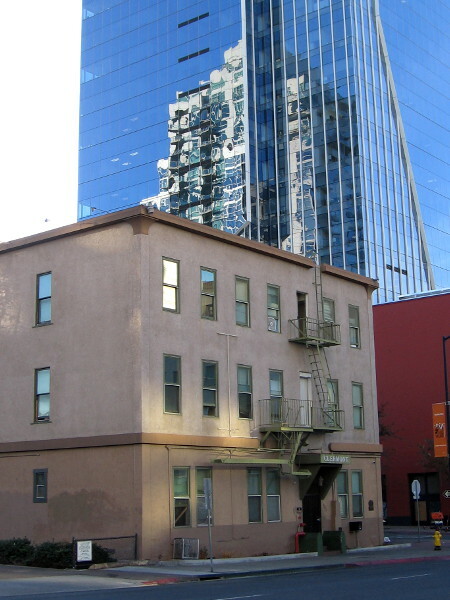 I was happy to spot some new (and old) cool sights along this stretch of downtown San Diego. So I took photographs! 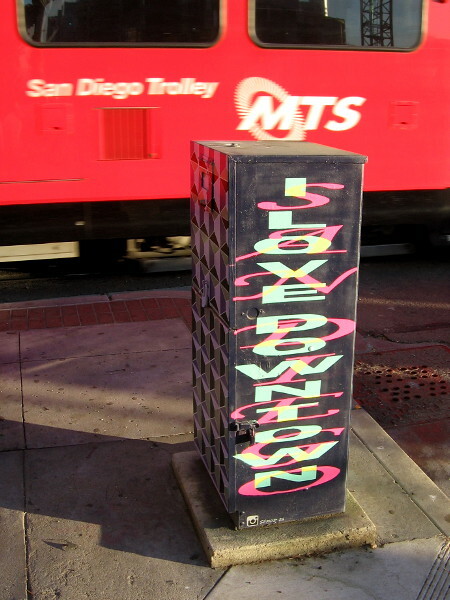 Some street art recently painted on a sidewalk utility box. I Love Downtown San Diego. Complex reflection in the windows of the building at 701 B Street, which has undergone some upgrades, including this west entrance. 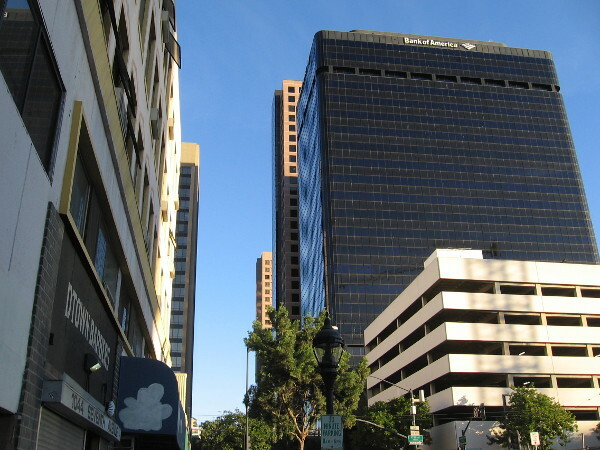 Looking north up Seventh Avenue through downtown San Diego’s Financial District. 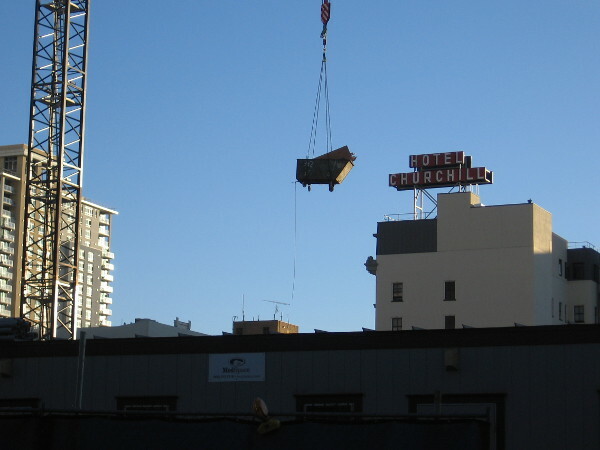 Crane swings a load above the Bosa Tower construction site, with the old Hotel Churchill sign in the background. 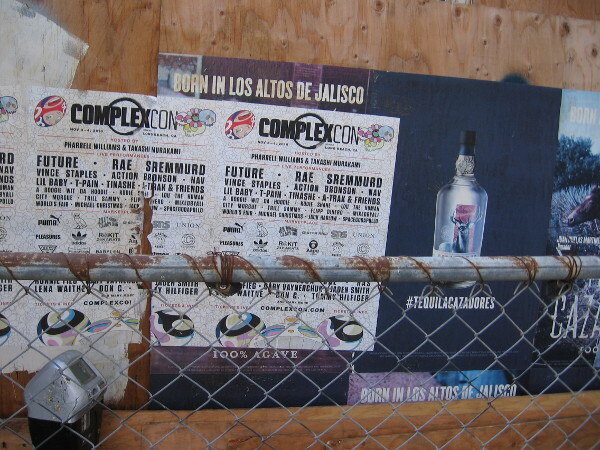 Advertisements peeling from another construction site fence. A huge mural is now being painted on the rear of the Moxy San Diego Gaslamp Downtown! 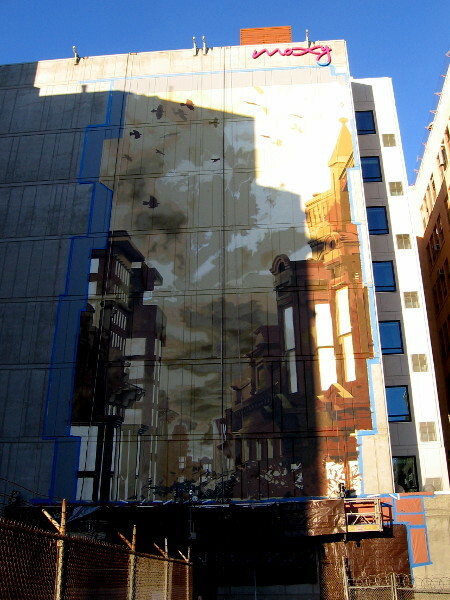 This cool new mural appears to depict part of the Gaslamp Quarter. Morning reflections on the shiny Sempra Energy building, with the historic old 1887 Clermont Hotel in the foreground. 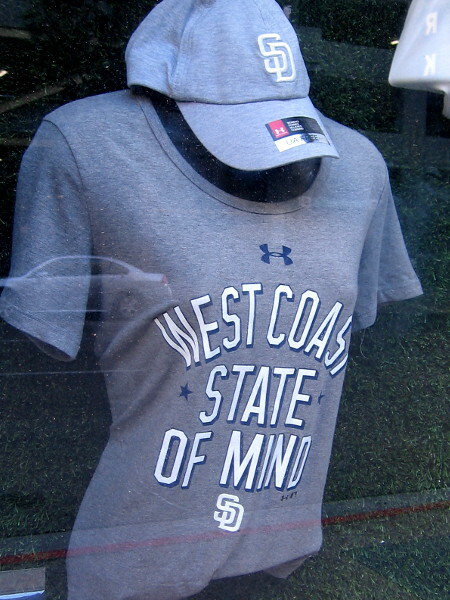 A new shirt with a West Coast State of Mind, in a window of the Padres Team Store, which is located in the Western Metal Supply Building. 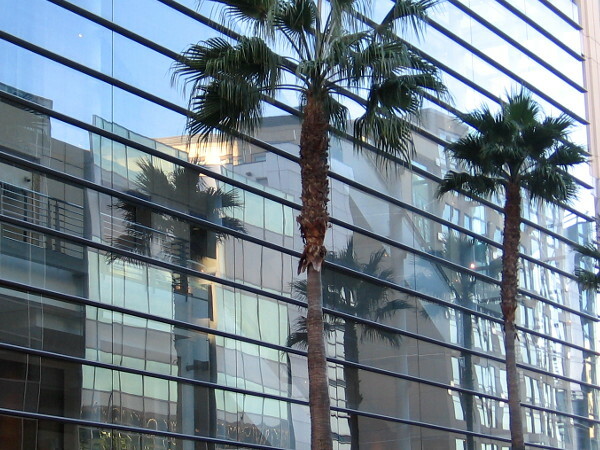 Palm trees reflected in the glassy, very modern Omni San Diego Hotel. Previous Previous post: Historical reenactment on Veterans Day in Balboa Park. Next Next post: Morning light along the San Diego River.